If you ever need to remove contacts from a group, you can use bulk actions or remove the contact individually. To remove several people from a group, you can segment your audience for certain criteria and remove them from the group. This method can only be used to remove multiple contacts from a single group. To remove contacts from multiple groups, repeat this process as necessary. Choose a saved segment, or click New Segment to make a new one. 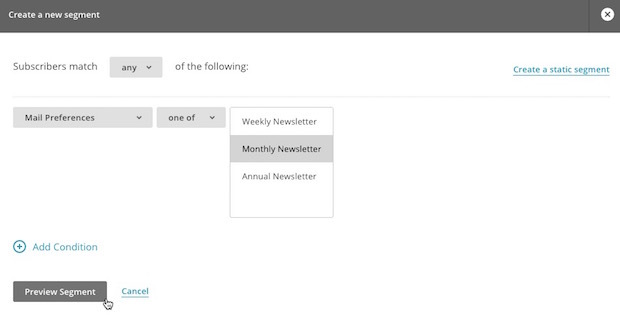 Click Preview Segment to open a list of subscribers in your segment. 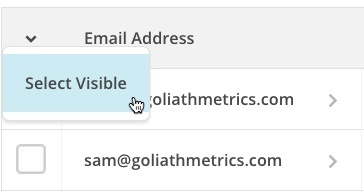 Click the arrow above the checkboxes and choose Select Visible to select the contacts who appear on the table. Click the Actions drop-down menu, and choose Remove from group. More drop-down menus will appear. First choose the Group Category, and then the Group Name from which you want to remove subscribers. In the Are you sure? pop-up modal, click Confirm. To select contacts on multiple pages, repeat steps 6–9 for each page. The selected contacts are still in your audience, but no longer in the group. To remove one contact from groups, edit their subscriptions in their contact profile. Click the contact you want to remove from a group to open their profile. Under the Groups section, click Edit. Remove the contact from any groups they should no longer be a part of, and click Save. Groups let you ask subscribers to categorize themselves based on common interests or preferences. You can use group data to help you send targeted campaigns. Use groups to let contacts categorize themselves based on their interests and preferences.